Get A Quote On Engraved Wood! Wooden signs are sadly underutilized in today’s world. Metal signs, plastic signs — those are everywhere. But wooden signs are few and far between. Fortunately, we’re setting out to change that. One sign at a time, we’re going to fix the world! Some call us dedicated. Some call us crazy. But we like to think that we’re on a mission. We have a vision, an idea of a better world. A more beautiful world. A world full of wooden signs. We’d like to put our lasers to work for you. So tell us about your idea! Whether it’s as mundane as marking bathrooms or as unique as a plaque for an interstellar craft, we want to help you make wooden signs for it. Metal may last longer in the uncertain depths of space, but wooden signs show that we’re a species with class and taste. That’s how you get the aliens to respond to your calls! ET aside, though, there’s plenty we can do for you here on Earth. We make wooden signs for every sort of business, from restaurants to accounting offices. Even a simple NO SOLICITING plaque becomes a work of art when you engrave it into wood! People appreciate the touch of class.If you don’t run a business, though, never fear. Wooden signs look great around the home, too! You could have a welcoming “Home Sweet Home” message or a classy engraving of your surname. Or if that’s not your style, tell us what suits your taste and we’ll make a sign just for you! Join us in our quest. Help us achieve our vision. Let us make a custom wooden sign for you, and get the world one step closer to the utopia we imagine it could be! Check out our parent company, LaserEngravingPros.com! How Can You Know Where to Go? Wooden Signs! Why do you need a custom plaque? Well, you’re an accomplished person, or you love a very accomplished person and want them to know that. You’ve done all sorts of great things in your life. But how will anyone know? If you tell them, you’ll sound like you’re bragging, and that’s a major social faux pas. So what’s the solution? You need something to do the bragging for you. A custom plaque isn’t the only solution, of course. For example, if you’re a rapper, you could just get two or three hype men to follow you around and talk up your accomplishments. This is a proven technique! But on the off-chance that you’re not a rapper, an equally good option is to get a custom plaque inscribed with news of your deeds. Then, when people read it, they’ll know how great you are. We can create a custom plaque for absolutely anything. Whether it’s a mount for a hunting trophy, the base for an award, or just an affirmation that you’d like engraved around your mirror, we can create the custom plaque of your dreams. Won a major award at work? That deserves a custom plaque. Got a Nobel prize? They’ll give you a shiny medal, but if you want a custom plaque to go with it, you’ll have to outsource that. We’ve done plaques for dozens of Nobel winners! That’s probably not actually true, but since we never inquire as to the Nobel status of our customers, who can say for sure? It’s certainly a possibility. Never again worry that people might not know who you are and what you’ve done. Hang up your plaque with pride, and let it do all the bragging for you! That’s the power of lasers and wood together. Your Trophy’s Going to Look Great on a Custom Plaque! Etching wood can make your product stand out. Everyone needs an edge in today’s world, and going for the classic look can be that edge you’re looking for! We can laser cut and engrave wood in virtually any shape. If you need assistance with customizing your product or design, we’ve got graphic designers standing by to make sure that you’re not etching wood fruitlessly. Your lumber doesn’t have to be flat. When it comes to etching wood, we can do flat wood, curved wood, any wood! We have various custom-built machines to meet the needs of the object that we are engraving. We can handle curvature. In fact, we fabricate lots of various objects out of wood. We produce wooden beer taps and signage for breweries. When they’re looking to market their brand and logo, they turn to etching wood. We engrave for depth, clarity and quality engraving that is sure to please the eye. Our graphics pop from afar! You can easily spot them from the other side of the room. Custom engraved wood gives off a great smell in our laser department. You always know when we’re etching wood with our lasers! We’re interested in etching wood as a way to display your message, brand or logo. We enjoy engraving wooden bats, signs, picture frames, tap handles and plaques. Etching wood is a natural and crafty way to display your message, company or idea! Maybe you have a plain, boring piece of wood. Talk to us about it! We’re prepared to make it much more interesting. Whatever you want on it, we can put it on there! A logo, a slogan, a blatant lie about a friend or enemy of yours. We don’t judge! We’ll do it for you. Are You Itching to Start Etching Wood? You know what makes wood better? Custom laser engraving. That’s right! Just look at this guitar. Without the flowers, it would be just like any other guitar. But with custom laser engraving, it’s a work of art! And you didn’t have to do a thing other than send us your idea. We do all the work! We have graphic artists on hand to turn your concept into wood-burned reality. We’re old hands at custom laser engraving. We’ve had lasers basically since they existed! We’ve used them to etch plastic, metal, glass and wood — especially wood. That’s really what we’re the absolute best at! 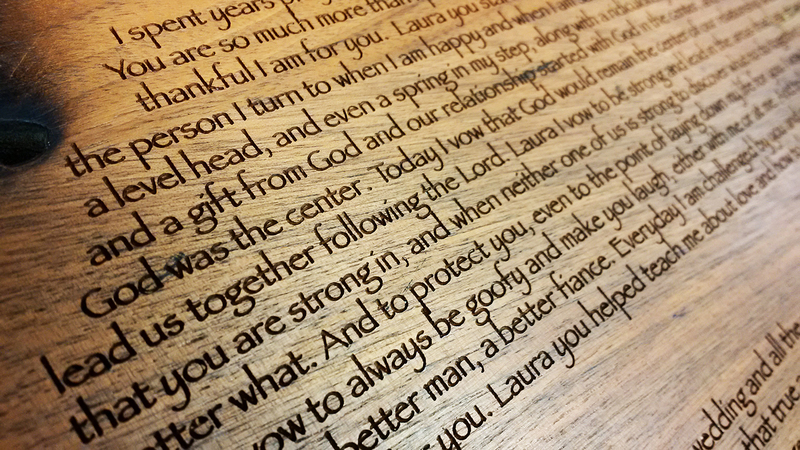 We’ve been custom laser engraving wood for years, and our talent is unmistakable. So what can custom laser engraving do for you? It can add class to your life! Whether it’s a guitar, a picture frame or just a favorite cutting board, custom laser engraving indelibly leaves your mark. No one will ever confuse your belongings for anyone else’s ever again! And that’s not all custom laser engraving can do. With just a quick flick of our lasers, we can instantly add style to anything you have! Imagine your favorite picture. Now visualize it with the artist’s signature laser-etched into the wood frame! Immensely classier. It’s not even in the same ballpark. It’s not even remotely close! If you’ve got wood, you need to get it in touch with our lasers. It’s a match made in heaven! They’re basically designed to be together. So how could you keep them apart? Get in touch with us today via email, phone or the convenient RFQ form below, and let us laser your wood into the form it was always intended to be in. Custom Laser Engraving Makes Your Wood Into Fancy Wood!